The two groups to suffer neglect and deprivation in a family structure are children with developmental disabilities, and old women. Having established our special school, we were urged to take up the cause of the second group by socially conscious members of the public. The plight of old, destitute women who were left without support, being abandoned by their families, was pitiable. In 2009 a multi-facility care centre was set up to provide relief to needy women seniors. Nineteen women were given a Home: food, clothing, shelter, healthcare – and affection. The numbers soon swelled. 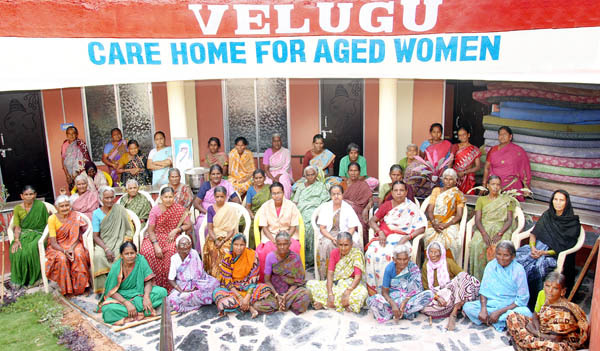 We have currently fifty women seniors between the ages of 70 – 85. In every way these ladies have made themselves at home. They are our grannies, our advisors, our fun and laughter group. We can learn from them traditional folklore, gardening tips, how to make pickles, and other wisdom that time may forget. It is wonderful to see the care they take of their Home. Serene and confident now, they spend their time at mostly at leisure, doing needlework and other relaxing activities.